According to SafeKids.org, 334 children were tragically killed in house fires in 2013. While we don’t often think of it, teaching your children about fire safety may make a difference if your family is ever faced with a fire in your home. Children are naturally scared when faced with disasters, and it is essential that they know what to do in case this situation ever occurs. Begin by educating them about fire alarms and smoke detectors, and show them where they are in your home. Your children may learn about fire safety in school, but preparing them at home is equally important. It can be difficult for children to understand the danger of a fire. In many cases, a child’s first instinct when faced with a fire is to attempt to hide—a natural reaction when kids are afraid of something. It is critical to teach them to immediately leave the home in the event of a fire. It is a good idea to teach your children two different ways to escape from their room and to get out as soon as possible. Teach your children how to unlock their windows and how to open them. Place escape ladders and ropes near high windows and balconies. Teach your children how to use them in case they should ever need it. Your children need to know that the smoke from a fire makes a house very dark, so they won’t be able to see in the event of a fire. Prepare them by teaching them how to navigate their house from memory. It is important for your child to know what to do as soon as an emergency strikes. Try changing the lyrics of a nursery rhyme to help them remember what to do should an emergency strike. Some children may not understand the purpose or importance of a fire alarm does. Explain that a fire alarm signals when there is a fire and that it’s important to respond immediately. You may want to enlist their “help” when changing the batteries and use that time to review safety information and procedures. Teach your children to start by feeling their door to determine if a fire is close. If the door is hot, they may need to use their safety ladder to go out their window. Be sure to tell them NOT to touch the door handle because the metal, if hot, could burn them. 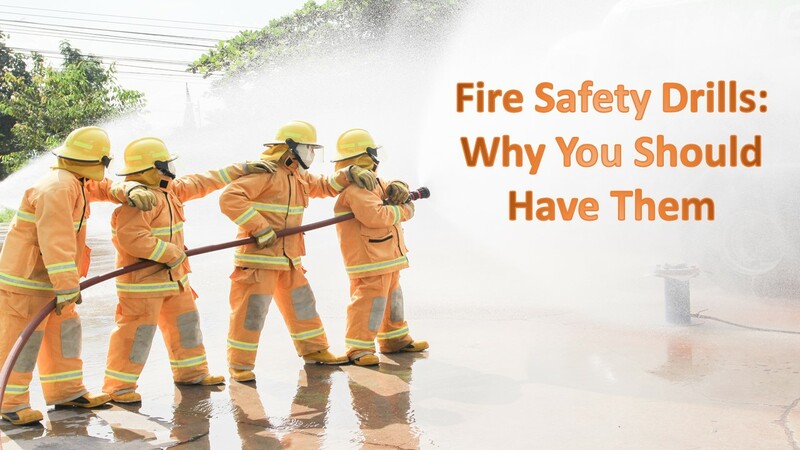 When talking to your children about fire safety, it is essential to teach them the ever popular tip of “stop, drop, and roll”—to fight the instinct to run if ever their clothes catch on fire. While your children are young, make sure to review fire safety every month. Have them recite your plan of action in case an emergency occurs. Ensure that they immediately go outside and meet you at your planned meeting spot. Teach them to never go back into the house, even if you are not outside yet. Your children will be safer if they are educated about fire safety. Develop an evacuation plan and teach your children how to react. Conduct fire drills in your own home to make sure they know exactly what to do. This could save their life one day. Kids love Halloween—and many of us big kids love it, too! Take a few minutes to prepare for trick or treating to ensure everyone enjoys the night and makers it home safely. 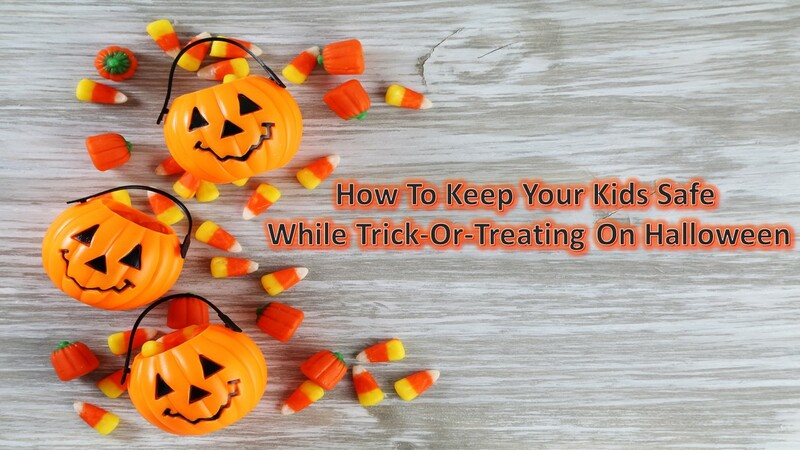 Here are some tips to share with your children before they go out on Halloween. Plan a route for your child before they leave the house. This way, if you get separated, you it’s easier to find each other. Also, make sure you and your children follow all the normal street laws. Only cross the street at street corners and use proper traffic signals and crosswalks. Never run, especially when crossing the street. Remind children to watch where they are going and refrain from using their phones while walking. Finally, avoid houses that are not lit up or decorated for the occasion. Children under 12 should not be allowed out alone at night, particularly on Halloween. Even if you feel your neighborhood is safe, remember that a lot of people are out at night and many of them are strangers to you and your children. If your children are old enough to be going out by themselves, be sure that they stick to a familiar area. Consider decorating costumes and treat bags with reflective tape or light-colored stickers. If possible, use face paint rather than a mask so that your child’s vision will not be impaired. Arm your kids and their friends with glow sticks and flashlights to help them see and be seen by other people, specifically drivers. With costume props, take care they are not sharp or long so that they do not potentially hurt other children. As a parent, you need to do your part to keep everyone safe by driving carefully. Slow down, especially in residential neighborhoods. Remember that children are excited and could potentially run out into the street. Take extra time at stop signs and look everywhere before proceeding. Eliminate distractions inside your car if possible so you can concentrate. It is more common thank you think for children to have various food allergies, so be conscientious of this on Halloween night. In general, inspect your child’s candy to see if there is any faulty packaging before they eat it. Consider taking away candy that doesn’t contain nuts so that you can still give something to children with allergies. Alarm Monitoring Service Of Atlanta wants to keep you and your family safe this Halloween season. Let the ghosts do the scaring and have a spooky safe time with your family! Your home security system certainly makes you feel more secure when you’re in your home, but it can also make your neighborhood a safer place. In fact, the more security systems in your neighborhood, the safer your neighborhood will ultimately be. Criminals are far less inclined to target your neighborhood if most of the homes are protected by a home security system. Working together with your neighbors to improve your community is a great way to become better acquainted with them. Once you get to know and trust your neighbors then you can all work together to keep your neighborhood clean and safe. The best way to keep any home safe is to install a home security system. The home alarm system contacts authorities when the alarm goes off and the video surveillance system can help to identify the intruders so it is more likely they will be caught. The more homes that are protected in your neighborhood, the less likely a burglar will be successful and the less likely a burglar will attempt a burglary in your area. Start by recruiting as many people in your community as possible. The more people involved, the better chance you have of being an effective force to stop crime. Contact your local law enforcement to schedule a meeting. They can help you create a plan of action for your neighborhood watch. Make sure you have a system to communicate with your neighbors easily and continue to have meetings and events to discuss what is going on in the neighborhood. AMSA provides one of the best home security systems in the Atlanta region. Consider installing a home security system and talk to your neighbors about installing one as well. One of the more obvious reasons for a home security system is to protect your family from any intruders. Homes that are not protected by a home security system are 2.7 times more likely to be burgled. You never know what may attract a robber, so it is important you have a way to keep your family safe. Home security systems can alert you and the local fire department if the system senses smoke or heat. A small flame can quickly turn into a large fire, so it is vital to have the fire department already on route to your home as soon as the fire begins. This could potentially save the lives of family members who may be trapped inside as well as help to save your home and keep the fire from spreading to others. Carbon monoxide is an odorless and colorless gas that is found in combustion fumes. Carbon monoxide can be released from many sources including wood and charcoal burning stoves and heating systems like furnaces. Carbon monoxide is completely undetectable without a carbon monoxide detector. Like the home smoke detector, you and emergency authorities will be contacted if levels of carbon monoxide are detected within your home. The faster your family leaves the home the less severe carbon monoxide poisoning may be, so it is very important to be aware as soon as there is a carbon monoxide outbreak. Your home security system can contact emergency personnel as soon as a disaster is detected. If you have an intruder, the police will be contacted. The fire department is contacted as soon as the security system senses fire. For any medical emergencies, paramedics will be sent directly to your home. A burglary takes place every 13 seconds in the United States. Crime statistics from the FBI show that almost 73% of burglaries are in residential properties. It is important to install a home security system to protect yourself from intruders, medical, and fire emergencies. You may know your house like the back of your hand. You might even be able to walk through it in the dark without tripping or bumping into anything. But in the event of a fire, with smoke making you cough and your eyes water, with heat bearing down on you from every possible direction, you could easily find yourself trapped with no way out. A practiced and well-known fire escape plan could mean the difference between life and death. Here are some tips for creating a fire escape plan and practicing it with your family. Identify two escape routes out of every single room. Such as the doorway and window. Make sure each escape route can be used safely by everyone, no matter their age or size. Consider drawing a floor plan of your home and hanging it somewhere everyone can see. This can be a fun activity and a great way to memorize escape routes. Install smoke alarms inside and outside of every bedroom. You want to make sure no one can sleep through a fire. The National Fire Alarm Code requires all smoke alarms in a home be interconnected so that when one goes off they all go off. Most home alarm systems come with interconnected smoke detectors as well as fire alarm monitoring to make sure a fire never happens without everyone in your home being made aware. Items that block windows and doors can also block your escape in the event of a fire. Make sure your exits are unobstructed and that you can find your way to one in case of a fire. If your doors or windows have emergency bars, make sure there are emergency releases inside and that everyone knows how to use them. If there are elderly family members, infants, or other family members with mobility limitations, make sure someone is assigned to help them out in case of a fire. If you have guests staying the night, make sure they know of the family’s fire escape plan and maybe even give them a copy of the floor plan so they know where to go in case of a fire. Make sure your address is clearly visible from the road. If not, paint it on the curb or mailbox so that it is. The fire department can’t put out the fire if they can’t find the house. Make sure everyone, even the children, know to call 911 once they’ve safely made it outside. Once you get outside, stay outside. No one should ever go back inside for someone else. Walk through your escape plan with everyone in the house. You want to make sure everyone understands how to get out in case of a fire. When walking through the escape plan, make sure exits are clear and all escape routes can be accessed easily. When a fire alarm goes off, you need to be able to get out fast. Testing your escape plan with an alarm and stopwatch is a great way to safely practice the urgency of a real fire. Once the family has practiced and knows the fire escape plan well, you should plan to hold a fire safety drill at night while everyone is sleeping. The objective is to make your drill as realistic as possible, not to frighten anyone, so it’s a good idea to notify everyone before they go to bed. Having a fire safety drill while everyone is sleeping is a great way to see how many people will wake up when the fire alarms go off. If someone doesn’t wake up during the drill you should make sure someone is assigned to wake them up in case of an actual fire. If your home has two floors, every family member should practice escape routes on every floor. Escape ladders can be placed near windows to create an additional exit. Make sure you read the instructions for the escape ladder and practice using it on a first-floor window so everyone knows how to use it when they need it. Children should only practice with adults and the ladder should be stored in an easy access location in case of an emergency. Fires create toxic smoke which rises. During your fire safety drill, family members should practice getting low and crawling to safety. Closing doors on your way out will slow the spread of the fire and give you more time to get to safety. In some places, like apartment buildings, you may not be able to get out. In this case, practice sealing yourself in. Close all doors between you and the fire. Use towels and duct tape to seal the door cracks so no smoke gets inside. Open any windows so fresh air gets in. Then call 911 and let them know exactly where you are. You can also wave a flashlight from your window so you can easily be found. As soon as your baby is old enough to crawl, it is necessary to start baby proofing anything that they could potentially reach. Here are some safety precautions you should take to keep your baby out of harm’s way. Use cameras to keep an eye on baby. There are many ways to protect your baby when they start moving throughout your house, but home automation makes it even easier to constantly keep an eye on your little one. Use your home camera system to watch your baby. Even if they’re safe in their crib, you may feel more comfortable being able to peek in on them. Secure heavy furniture – such as bookshelves, TV’s, and dressers – with straps to hold them in place. A baby can climb onto these and fall off or become trapped under them if they fall over. Soften sharp edges of furniture. Apply stick on cushions to all table corners. You don’t want baby to hit their head on any sharp turns. Use cord holders for wires. Use cord holders for all electronics so that baby is not able to reach them. This will keep them safe from becoming tangled up in the wires or pulling them from sockets and appliances. Install motion sensors to alert you when baby is on the move. Keep track of your baby with motion sensors that can tell you when they are moving from one area to another. This allows you to make sure they are always in a safe place. Door sensors can be put on cabinets to alert you if baby is in them. Install door sensors so that you are aware when your baby is near anything that could potentially hurt them. Additionally, you should secure cabinets with baby proof locks. Fire and carbon monoxide detectors keep baby safe. Make sure the smoke and carbon monoxide detectors are working in your baby’s room and anywhere they may sleep. It is very important for their safety as a baby has a much harder time breathing than a full adult when smoke or CO2 gas is released. Use home security to keep intruders out. Install a home security system, like the ones provided by AMSA, the leading home security company in Atlanta. Your baby and family will always be safer with a home security system. Take advantage of a home security system with home automation to make keeping track of your little one, and keeping them safe, a little more convenient! It is vitally important to remember the crucial difference between residential crime prevention and residential crime reaction. Residential crime reaction refers to when a crime has already occurred in your home or neighborhood and then the authorities are called to do something about it. Residential crime prevention refers to when a home security system is installed and you take valuable steps toward keeping your home safe. The most significant part of home security is that you take the steps to be proactive rather than reactive to keep your home, your valuables, and your family safe. Once you are aware of an intruder in your home, you will call the cops. At this point, precious valuables have most likely already been taken from your home and you will probably never recover them. In some instances, it could take your local police force anywhere from fifteen minutes to a full half an hour to respond to a break in, giving an intruder plenty of time to take what they want from your home and leaving you and your family vulnerable as you wait for the police to arrive. Protect your home and your property before a break in ever even occurs. Arm your home with a state of the art alarm system, so that you will always know when someone enters your home uninvited. Install security cameras as well. They can videotape any intruder that enters your home, increasing the chances of the intruder being caught by the police and ultimately increasing the chances of your valuables being returned to you. Take a proactive approach when it comes to home security and know that your home is safe no matter what. Alarm Monitoring Services of Atlanta provides the best home security system in Atlanta. Their technology protects your home even when you are not there. By protecting your vacation home, you gain peace of mind and protect your real estate retreat. To start, it is essential to have a reputable home security system in place for your second property. Often, vacation homes are less likely to be occupied, leaving increased risk of an intrusion, so a home security system can serve as your ears and eyes in your absence. Here are 7 additional vacation home security tips to keep your home away from home protected. The strongest materials for entry door points are solid wood or steel. These access doors also need to have high quality doorknobs, hinges, and locks so that they cannot be easily tampered with. You’ll want something that won’t rust and weaken. If there are windows directly next to the door, make sure they are made of shatterproof glass. It is suggested to have peepholes and sturdy door chains for your vacation home as well. It is essential to have locked windows to make sure that an intruder will never have an easy access point into your home. Separately, it is recommended by experts to have heavy duty frames that could withstand extreme weather such as a hurricane or flooding, depending on the location of the home. Automated lighting is both a benefit for safety and security. Ensuring that pathways are well lit helps prevent falls as well as gives the appearance of an occupied property when you’re not at your vacation home. Interior home automation is not only a matter of convenience, but it helps deter intruders by giving the impression that the home is occupied. Schedule lighting to replicate patterns when the home is in use and turn on lights prior to your arrival for a well-lit and welcoming start to your vacation. Most home security systems have wireless home security cameras included, but it is important for them to be visible to anyone entering the home and on the exterior to prevent an attempted break-in. An intruder is much less inclined to attempt a break in if they know there is video footage of them entering your home. Home security monitoring immediately alerts you by text message and/or e-mail to anyone entering your home. When a home security system is professionally monitored, you’ll not only receive immediate alerts if someone attempts to break in but the alarm company will contact local authorities in your absence. Especially if your vacation home is far away, this is an easy way to secure your home. Fire alarms or smoke detectors should be installed in each room and tested each month. For your vacation home, combining smoke detectors with professional alarm monitoring is the most comprehensive approach to home security because the home is less likely to be occupied, therefore a fire alarm would be unattended without home security monitoring. By combining these home security practices for your vacation home, you’ll benefit from both peace of mind and improved security in your absence. At AMSA, our top-rated home security and home monitoring services help customers not only secure their Atlanta home, but also their vacation and rental properties.